*Hoffman Square Gym offers an indoor area for games, basketball, walking & other indoor sports. Rental fee for the day is $50. *Located behind the Hoffman Square, the well-groomed softball/baseball diamonds offer a place for family or pick-up ball games. You must bring your own equipment. *Adjacent to Highway 27, the City park has a covered picnic shelter ideal for families & small groups. The well-maintained park also has a playground for children. *Located in the Hoffman City Hall building. At $75 for a rental this is the perfect place for get togethers of all kinds! *Elk Lake has a beach with certified lifeguards during the swimming season. There is a dock and a diving platform. Swimming lessons through the summer recreation program and open swimming for the public are available. 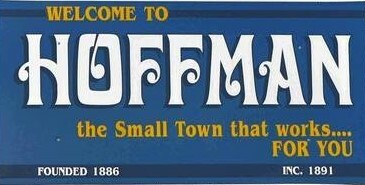 The beach is maintained by the City of Hoffman. *Located on the southern tip of Elk Lake, this city owned campground has 26 well-maintained sites. Reservations for daily, monthly or seasonal sites can be made. Campsites have electrical, water and sewer hookups with a dumping station also available. A public watercraft landing and beach are adjacent to the campground. Open mid-May through mid-September. Skates are available in the heated warming house for your use. Members of the Alexandria Blizzard's Hockey Team will be here to skate with area youth on January 22, 29, February 5 and 12 . *Summer recreation for children of all ages is part of the West Central Area Schools community education program. Swimming lessons, softball, T-ball, & other sports are available. *The Hoffman community is close to many fine fishing lakes offering a variety of pan fish & game fish species. See the DNR for maps of lakes in this area. A fine assortment of live bait is available at Casey's located on Junction of Highways 27 and 55. *Winter sports enthusiasts flock to Andes Tower Hills for downhill skiing, snowboard, tubing, & cross country skiing. The 3 chairlifts & 15 downhill runs that can be used by beginners, intermediate and expert skiers/boarders. The tubing hills also offer a variety of hills for those who enjoy tubing. The cross country trails have been rated in the top 5 in the state of Minnesota & are great fun all season! There is 800 acres and over 10 miles of trails offered to skiers & snowboarders alike. A comfortable warm chalet offers a cafeteria, pro shop, rental shop, overnight lodging, & private meeting rooms to complete the enjoyable experience.